As tensions in Venezuela have escalated between Nicolas Maduro’s regime and protesters, rumors circulated that Maduro’s Russian allies had deployed troop or mercenary support. The rumors were proven to be likely true due to the first sighting of troops unloading from two Russian planes in Caracas on March 23, 2019. Shortly after Juan Guaidó was declared Interim President of Venezuela earlier this year, rumors began to circulate online that Kremlin-funded Wagner private military company contractors had deployed to the country. The Kremlin has particular interests in Venezuela, including various oil projects and private military contracts. The DFRLab has been following traces of Wagner activity around the globe, including in Syria, Ukraine, Russia, Libya, and the Central African Republic. In this particular case, the rumors claimed that Wagner had sent a unit of contractors to Caracas to provide close protection for Maduro. According to Colombian media website NTN24, Maduro’s government and Russia reached an agreement for a formation of a Russian military base in Guayana, a territory in the northeast of Venezuela. Similar speculation appeared in December 2018, when The National Interest argued that Russia is aiming to establish an aerial bomber base in Venezuela. On March 23, 2019, photographs began to circulate showing Russian airplanes carrying troops allegedly landing in Caracas. At least four photos of the two Russian aircraft — the Antonov An-124 and the Ilyushin IL-62 — appeared on various social-media accounts. Despite the fact that these posts did not mention the exact location of where they were taken, the photos were easily geolocatable. The photos also captured soldiers standing on the airport tarmac, though they did not allow for confirmation of the soldiers’ identities or their units. The images were sufficiently detailed, however, to provide open-source evidence of Russian military presence in the area. 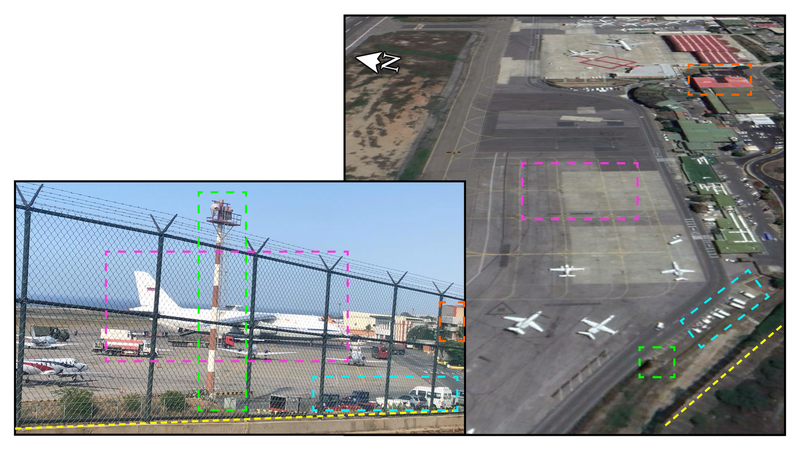 Photos taken from different angles showed Venezuela’s main airport, the Simón Bolívar International Airport in Maiquetía. 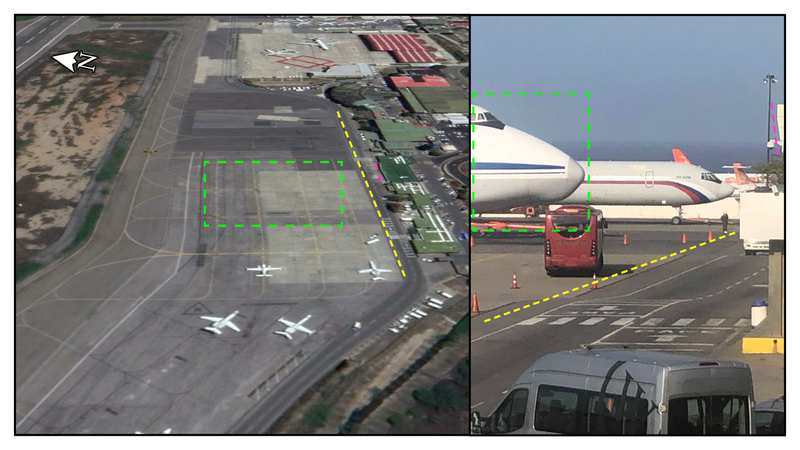 Both planes were photographed in the southern part of the airport, on the apron close to the terminals. The variety of photos from different angles indicates that the photos are real and not photoshopped. This cross-referencing allows for higher confidence assessments because of the correlation key details between these photos. Two photos also captured at least part of the military contingent that flew in with the Ilyushin IL-62. The lack of detail in the photo, however, makes it difficult to determine the unit to which the soldiers belonged, as well as the exact size of the group. Various reports mentioned the two planes flew into Maiquetía from Syria; while the soldiers can be seen sporting desert camouflage uniforms in the pictures, it does not necessarily corroborate these claims. According to the report from NTN24, the military contingent that landed in Venezuela consisted of 99 soldiers, a number that closely matches other media reports. Further corroborating the claims of a Russian military presence in Venezuela, the Washington Post reported that a Russian oil tanker was spotted on the shores of Venezuela on March 22, 2019, a day before the Russian aircraft landed. The oil tanker reportedly belonged to Russia’s state-run oil giant Rosneft, which established a presence in Venezuela to relieve some of the economic burden caused by U.S. sanctions on oil products. Speculation regarding the establishment of a potential Russian bomber base in Venezuela has been circulating since December 2018, but open-source data has not confirmed the allegation. 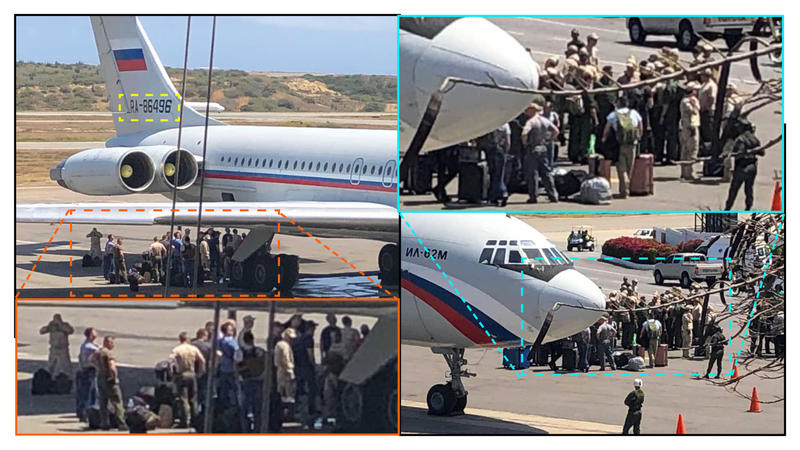 The March 23 photos of Russian aircraft and soldiers landing at the Caracas’ Simón Bolívar International Airport, however, served as initial proof of a growing Russian presence in the region. While we have high confidence that the troops getting off the Russian planes were Russian, we have no open-source indication of whether they are official Russian military or simply Russian mercenaries like the Wagner contractors seen elsewhere around the world. Currently, it remains unclear what the deployment is intended to achieve or what the scale and scope of the operation might be. At minimum, the reports of the Rosneft oil tanker in the area show that the Russian footprint in Venezuela is growing. The DFRLab will continue to monitor the Russian military presence in Venezuela.